This is one client that I really wish I got a picture of the first time she came to me. Her hair used to be very short, I'm talking shaved on the sides and in the back with a little hair on the top to style. It was also much thinner. 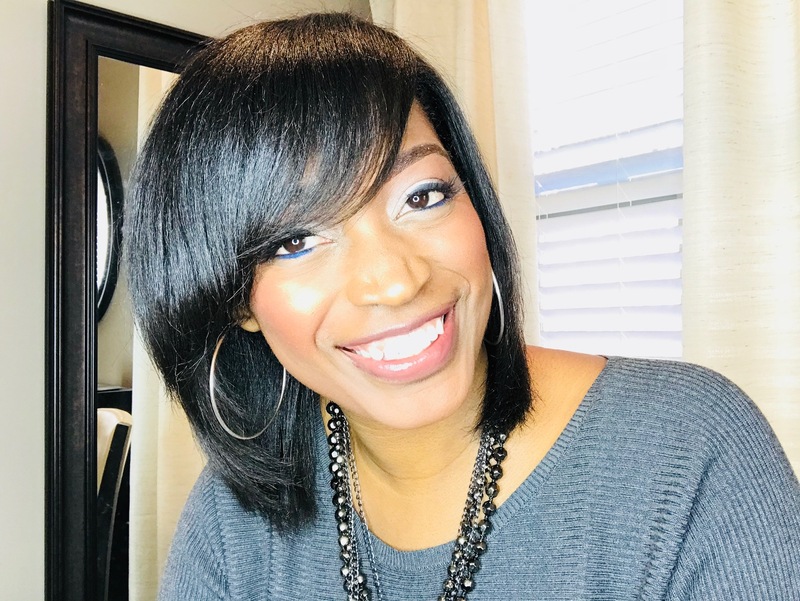 She said that after her second child, who is now in middle school, was born her hair got noticeably thinner. Before then it was very thick, but never seemed to be the same again after child number two. She was going to a professional hairstylist but said that her hair would never grow. She never got it cut and it still never grew. She told me that she had just made herself accept the fact that she would always have short hair. She wanted it to grow but had no idea what to do. She began coming to me a little over one year ago and I immediately began giving her hair some t.l.c. I gave it a good shampoo and deep conditioning treatment with Silk Hydration by L. Jones products. She also bought some Silk Hydration products for her own personal home usage. 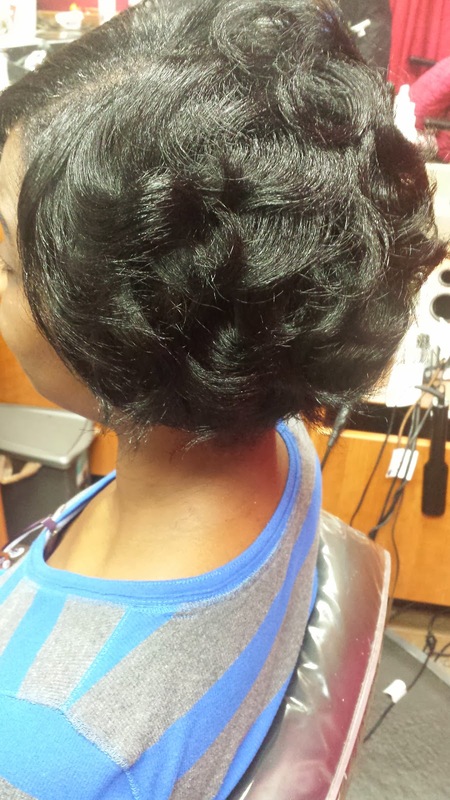 I also encouraged her to start stretching her relaxers out. 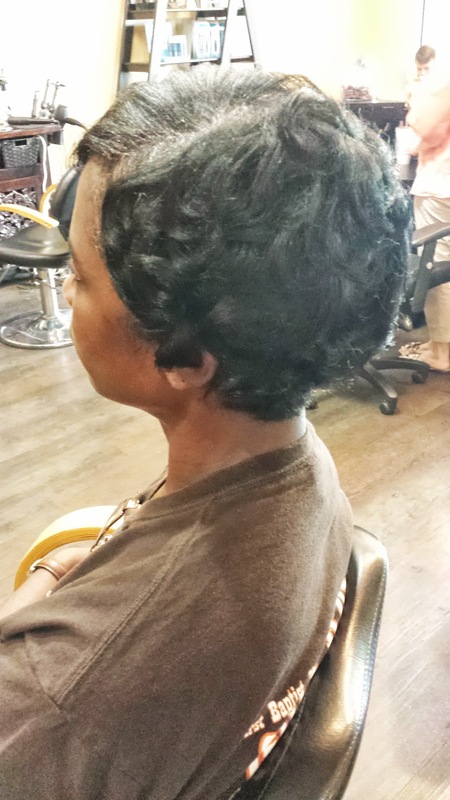 Just like many other women, she was getting a relaxer every 6 weeks. We began doubling that to twelve weeks and are now working our way up to sixteen. 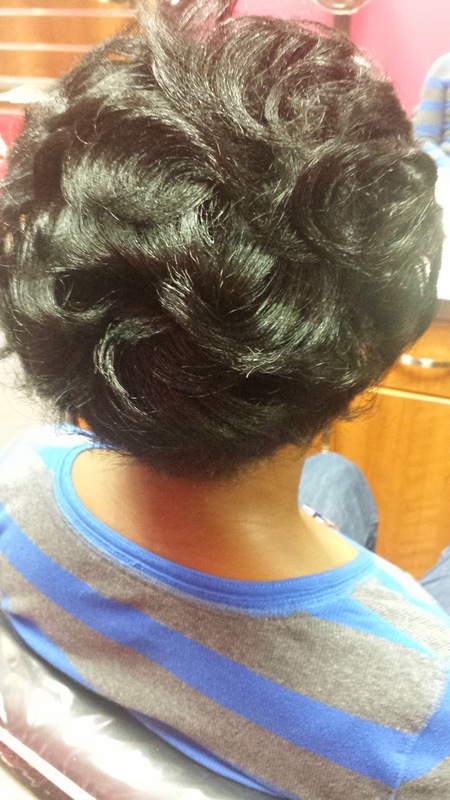 In between relaxers I used Silk Hydration by L. Jones Clarifying Shampoo on her hair first. Then I followed up with Silk Hydration by L. Jones Moisturizing Shampoo (which was the old formula and still produced great results, it is now new, improved, and even better!). Next I would use Silk Hydration by L. Jones Intense Moisturizing Treatment on it to soften it up and give it that silky feel. After rinsing that out, I sprayed Silk Hydration by L. Jones Leave-In Conditioner on it to give it an extra layer of moisture and also a layer of heat protectant. Then I would mold her hair down with foam wrap and put her under the hair dryer. 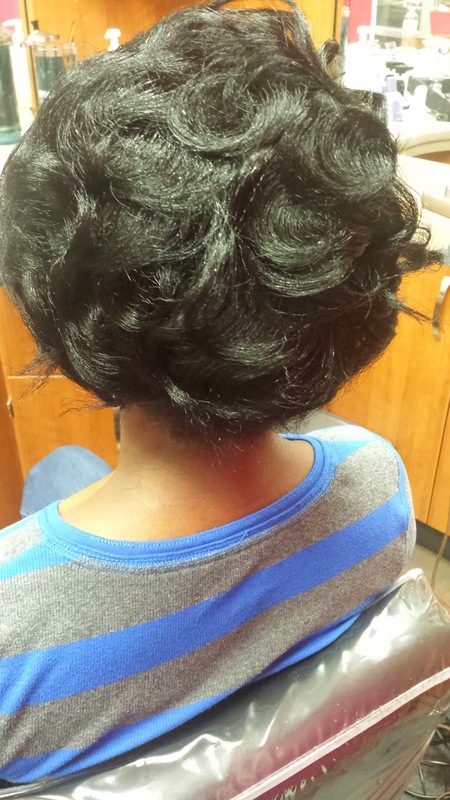 After her hair was completely dry I would then flat iron it and style. For the finishing touch I sprayed Silk Hydration Miracle Potion no.9 to give it shine and protect from humidity. 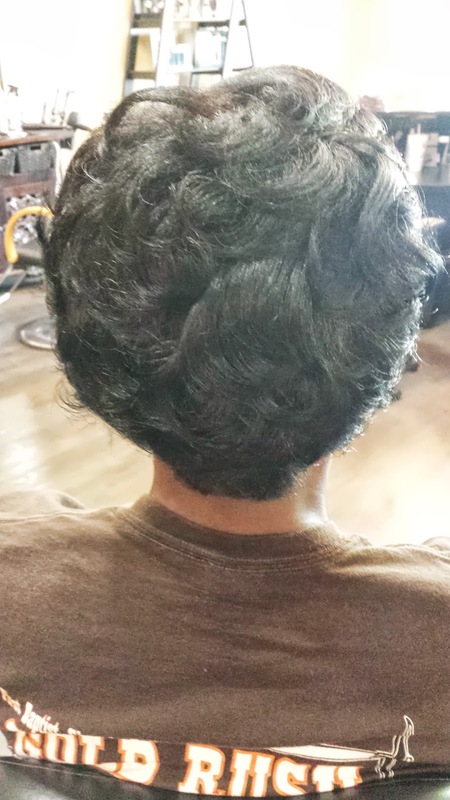 She said even her co-workers have noticed a difference in her hair. One of them even asked her was she now going to a different hairstylist because she noticed how thick, healthy, and long her hair has gotten! She can now actually wrap her hair around her head which she says is the easiest way to manage her hair now. She wraps it then unwraps it the next morning and does not put any more heat in it until she is ready to shampoo it again. Now her hair is past ears and approaching covering the back of her neck. Her goal is to get it about neck length so she can have a bob. And at the rate her hair is growing she will have that in no time.. 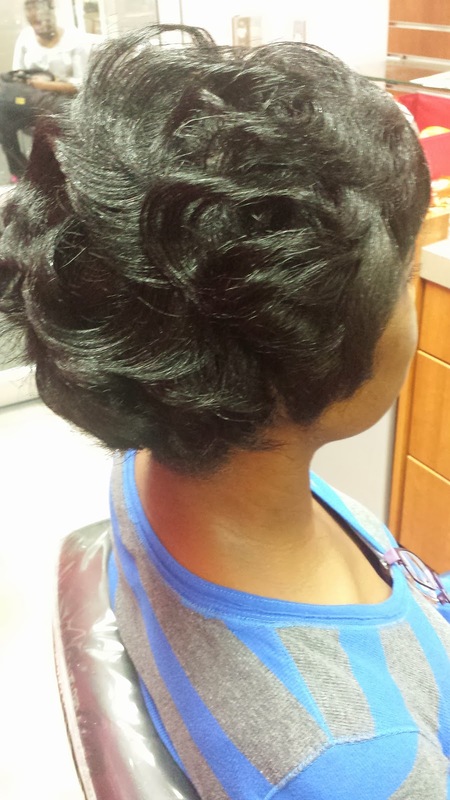 This client is proof that your hair can and will grow. You only have to be willing to do your part in helping it. And finding a great hairstylist would not hurt either, that way you can simply maintain what the stylist did instead of having to tackle your hair all on your own. Keep the heat to a maximum of once per week or less. Shampoo every week. 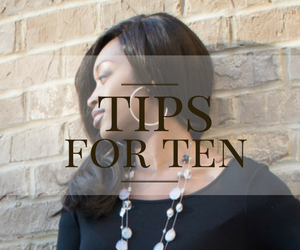 Keep your ends trimmed every 10-12 weeks. 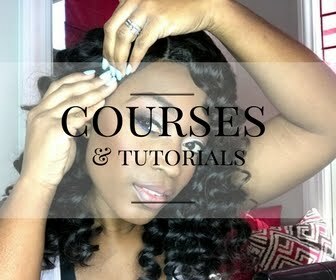 And most importantly, wrap your hair every night!! 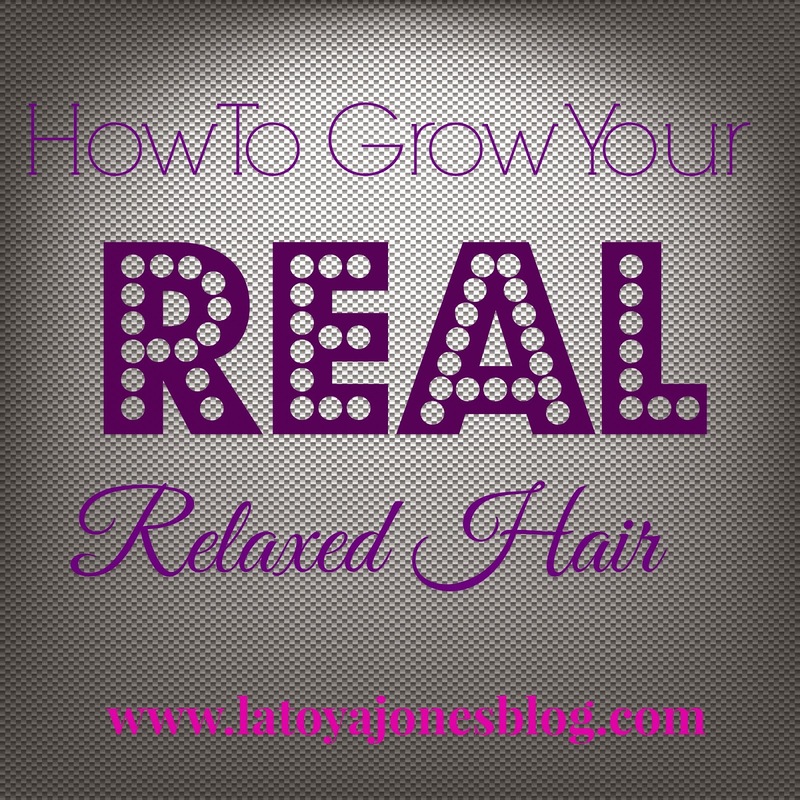 Do these simple things and watch how fast your hair starts growing. 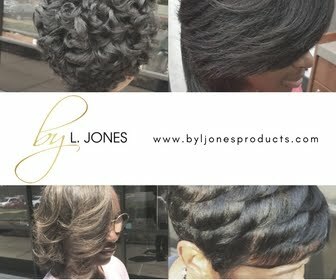 To shop for your very own Silk Hydration by L. Jones products click here!